I first wrote about rainy day outdoor fun shortly after starting this blog (when only my friends were reading! ), so I figured an update was in order, especially since we’ve been seeing quite a few wet days around these parts recently. 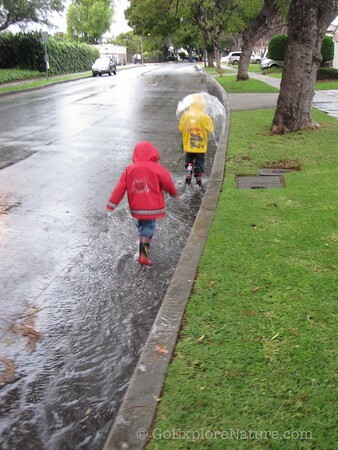 When I asked the boys last night to tell me their favorite thing to do in the rain, they looked at me as if I was crazy. “Jump in puddles.” Isn’t it obvious?!? Sometimes I nudge them to see who can make the biggest splash or jump the highest, but really they just want to be left to it. The Big Explorer loves all things science. When it comes to spending time in the rain, he likes to head out to the curb and watch the water flow by. When he was younger, he was curious where the water was headed and whether certain things he put in the water would float or sink. This year, we’re planning on measuring how much rainfall we get on any given day. 3. Quack like a duck. This one may only work with the younger crowd, but the 3 ½-year-old Little Explorer absolutely loves it. He quacks like a duck, ribbits like a frog and even makes fish faces to pretend he’s a fish. One wet afternoon, we made rain art using paper plates, food coloring and rain droplets. Other possibilities include mud painting and making chalk drawings on the pavement. It’s also fun to create land art with wet leaves, sticks and other natural items. Use a plastic pail or jar to catch raindrops. Make it a game to see who can catch the most water the fastest. Encourage kids to try catching raindrops on their tongue, too! 6. Listen to the sounds of rain. Spend a few minutes just listening to the sounds of the weather. Set out various objects (like metal, plastic and glass containers) to see how water droplets sound when they hit different surfaces. You might be thinking mud pies here, but my boys prefer making mud balls. That’s right, grabbing gobs of mud and running it through their fingers, then trying to throw them like snowballs. Sound fun? 8. Go on a safari. Wet weather brings out creatures you might not normally see, like worms and snails. It’s also fun to go searching for animals that are trying to seek shelter from the rain, like birds and spiders. Once the puddle jumping is out of their systems, The Explorers also like to walk in the rain. It’s especially fun to explore our backyard right after a rain, when water droplets are still all around and creatures are resurfacing from their hiding spaces. Sticks, small pieces of wood and leaves all make great boats. Which items make the fastest boats? Which sail the furthest? 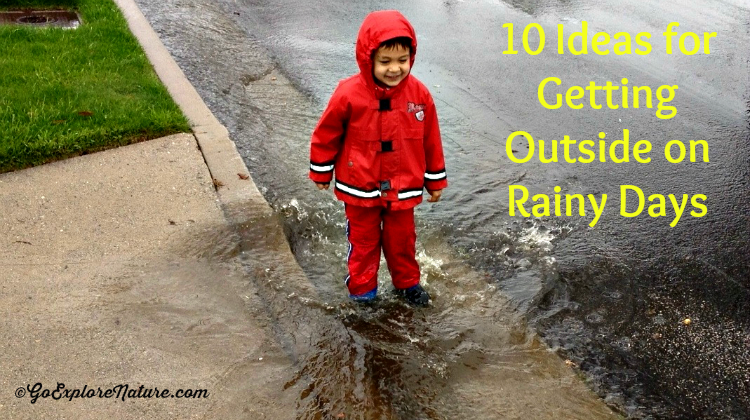 What do you like to do outside on rainy days?